This post was originally published on the We Are Not Numbers website on April 19, 2018. Karama Fadel is a Gaza-based writer for WeAreNotNumbers.org. Other posts by Karama Fadel. Thank you Karama Fadel, Abeer Abu al-Naja, and Yousef al-Kurnz. How is it even possible to smile so gently, kindly, and brilliantly after all that you’ve endured and are enduring, Yousef? It must be the Palestinian in you and your inherent Sumud… I will always be privileged to be in solidarity with you and your millions of brothers, sisters, mothers, fathers, children, and grands. Well said. Count me in. Israeli forces reportedly kill at least four protesters and wound over 400 as thousands of Palestinians participate in Gaza Return March demonstrations on Friday. Palestinian and Israeli media reporting that four Palestinians have been killed during today’s protests in Gaza, among them a 15-year-old boy. Thanks Just. Four more murders in cold blood by the most moral army in the world. “NERMEEN SHAIKH: This isn’t the first protest of its kind in Israel-Palestine, but is it the first one in which the Israelis have responded so disproportionately? “RASHID KHALIDI: It is not the first of its kind. The most underreported story in Palestine is the non-violent nature of an enormous amount of protests. We pay a lot of attention to violent actions. But the first intifada was largely nonviolent. For three or four years, Palestinians were engaged in massive nonviolent protests, which were met with systematic repression. Rabin said ‘Break their bones.’ That was his order to his soldiers when he was defense minister. So it’s not the first time that the Israelis have used this kind of violence. I don’t think that they’ve ever gotten to the point of shooting down literally thousands of people in this way, so maybe that is unprecedented. “NERMEEN SHAIKH: And what do you think accounts for that? That is the price of freedom for people like Jon S and Boris who always use the L’ORÉAL excuse. Because they are worth it. This is the “price” paid at the hands of brutal, racist, genocidal, ethnic cleansing, land-stealing, fascist, terrorist Zionist Israel! Urgent, and four days later. I imagine the high court went out for drinks after that swift decision. Bastards. 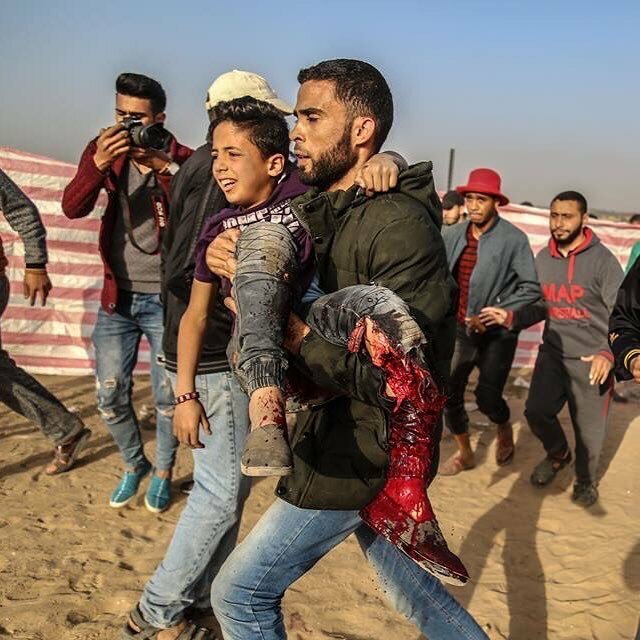 Why not an update today in Mondoweiss on the carnage in Gaza, “compliments” of Zionist Israel: four murdered, including a 15-year-old and several hundred wounded yesterday, bringing the total to at least 41 murdered and several thousand wounded and injured in Gaza’s Great March of Return. Also, Mondoweiss, why don’t you post these photos (see below) to better illustrate how racist, fascist and terrorist is the Zionist regime in control of both Israel and what little remains of Palestine?